This is the Happy Kava Brand Wild Lettuce Kava Tincture Blend. Happy Kava Brand has expertly formulated a line of Kava Tinctures that take the best of organic or wildcrafted herbs. There are a number of herbs that have made it into the mainstream. Even those not super familiar with different herbal products have now probably at least heard of the 12 herbs we have chosen to blend with our Noble Kava Root with the Happy Kavalactone lineup. We love this blend for just that; meditative trance states! This was another match made in heaven in our eyes. And, the blend turned out to be far more tangible and effective than we had expected. It took a lot of formulating to get the balance “just right”. But we feel we really captured the best that these two natural supplements have to offer with the Wild Lettuce Kava Tincture Blend. We add the equivalent of one teaspoon of ground Wild Lettuce extract into every serving of this tincture (4 dropperfuls is a single dose). We don’t add any other filler herbs that may or may not help get the creative juices flowing. All we have in this award winning Wild Lettuce Kava Tincture Blend tincture is pure Noble Kava root with a 2-4-6 or 4-2-6 Kavalactone lineup, and pure Wild Lettuce extract. Look to TheKannaShop for much more information on Kanna. *These statements have not been evaluated by the Food and Drug Administration. 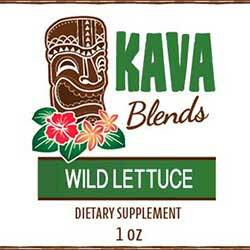 This Happy Kava Brand Wild Lettuce Kava Tincture Blend is not intended to cure, treat, diagnose, or prevent any disease.